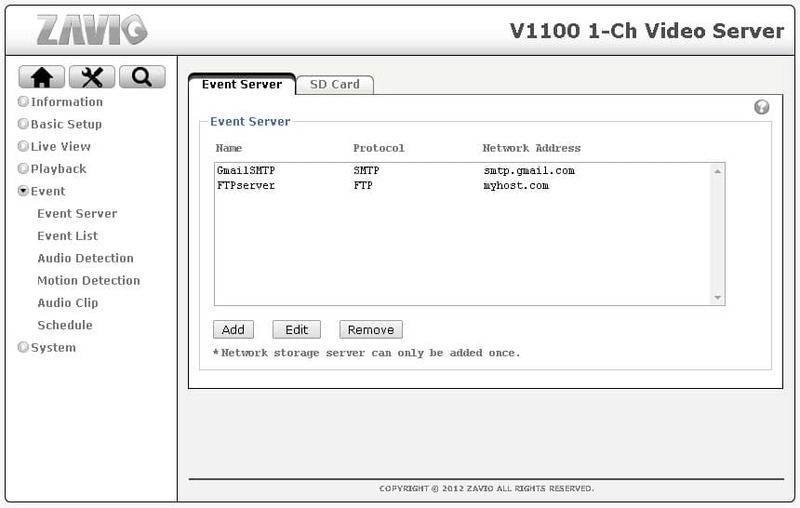 Zavio network IP cameras can FTP upload images and videos to an FTP server that you designate. Users may configure their camera to upload images or video surveillance according to any of the below rules. The most common upload rule is "periodical" / according to a schedule. For example, Zavio IP cameras can be used to capture photos for time-lapse photography by taking a snapshot at a defined interval (like every 5 minutes for example). You can see an example of a time-lapse photography project that we performed at CCTV Camera Pros with a Zavio camera here. All Zavio IP cameras and network video servers support FTP uploading. A network video server can be used to enable this functionality on any CCTV camera. 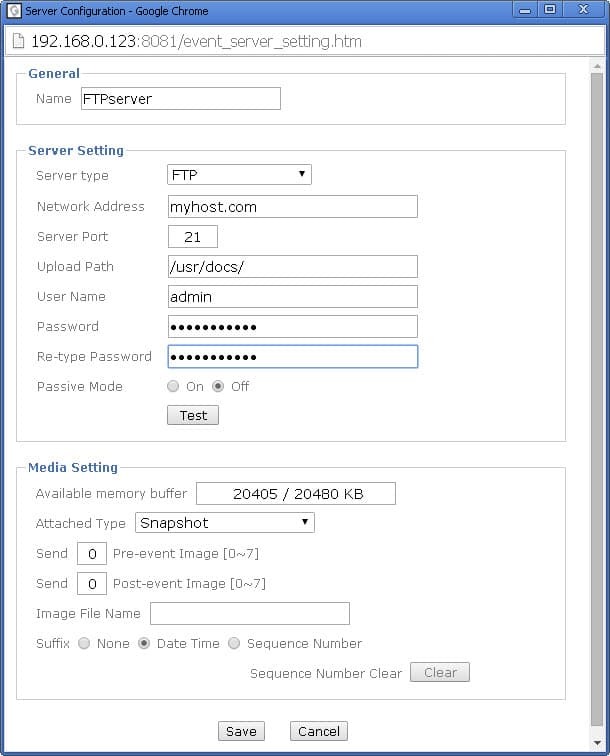 Follow these directions to setup FTP image or video uploads for Zavio IP cameras. Login to your camera in a web browser. From the menu on the left, select Event > Event Server. Click Add. On the Event Server screen, choose a name for this server (can be anything you like). Then, fill in the connection information for the FTP server that you will use. You can click on the test button to make sure that your IP camera can successfully communicate via FTP with the server. Choose if you want to send a snapshot image or video. Click Save when done. Next, select Event > Event List. Then click Add. This is where you will configure the rules for when to upload the picture or video. On the event page, choose a name for this event (it can be anything you like). 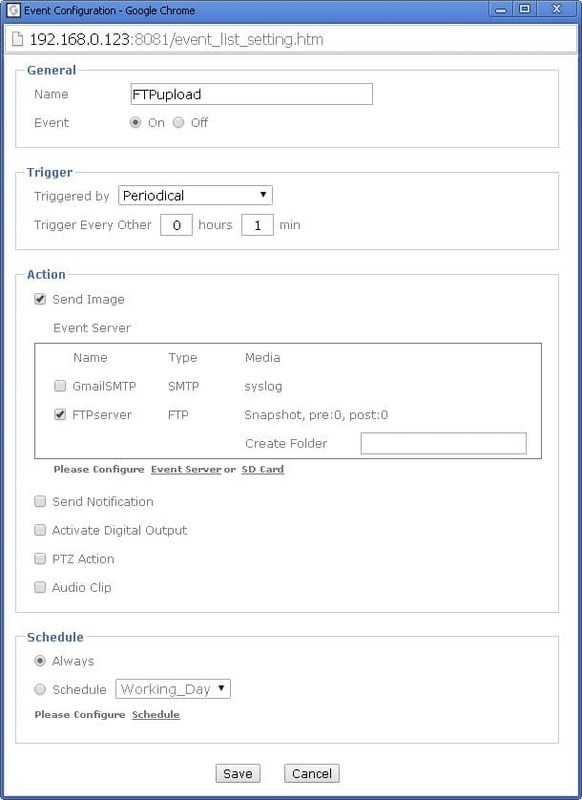 Choose the type of event that will trigger the FTP upload in the "triggered by" drop-down. If you choose periodical, you can choose how often an image should be captured. For example, every 5 minutes. Check the Send Image checkbox, then check the box next to the FTP server that you previous;y configured. In the schedule area, choose "Always" or set up a schedule. Here are the other types of events besides periodical that can trigger an FTP upload. Please note that not all of these are applicable to all Zavio IP cameras and network servers. For example, the PIR option is only available on cameras that have a built-in PIR motion sensor and the IR cut filter is only available on cameras that have built-in infrared LEDs.